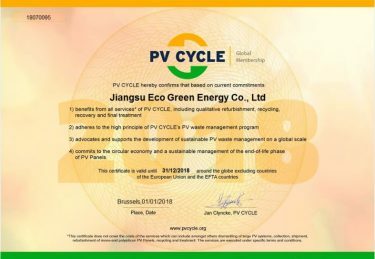 PV CYCLE was founded in 2007 to implement the photovoltaic industry’s commitment to setting up a voluntary take-back and recycling program for end-of-life modules. The members of PV CYCLE are manufacturers or importers of photovoltaic modules in Europe, and the association currently represents 85% of the European photovoltaic market. The aim of the association is to provide clean and renewable energy as well as to apply the principle of extended producer responsibility, and thereby make the photovoltaic industry “double green”. PV CYCLE is currently setting up collection points across Europe where installers and citizens will be able to dispose of worn-out modules. End-of-life modules will be separated into crystalline and thin-film modules and taken to a PV CYCLE recycling center where they will be sorted by their product number and manufacturer and then weighed before being disassembled into their main components and recycled. The recycling program is financed by the member companies. PV modules contain materials that can be recovered and reused in either new PV modules or other new products. Industrial recycling processes exist for both thin-film and silicon modules. Materials such as glass, aluminum and a variety of semiconductor materials are valuable and reusable when recovered.